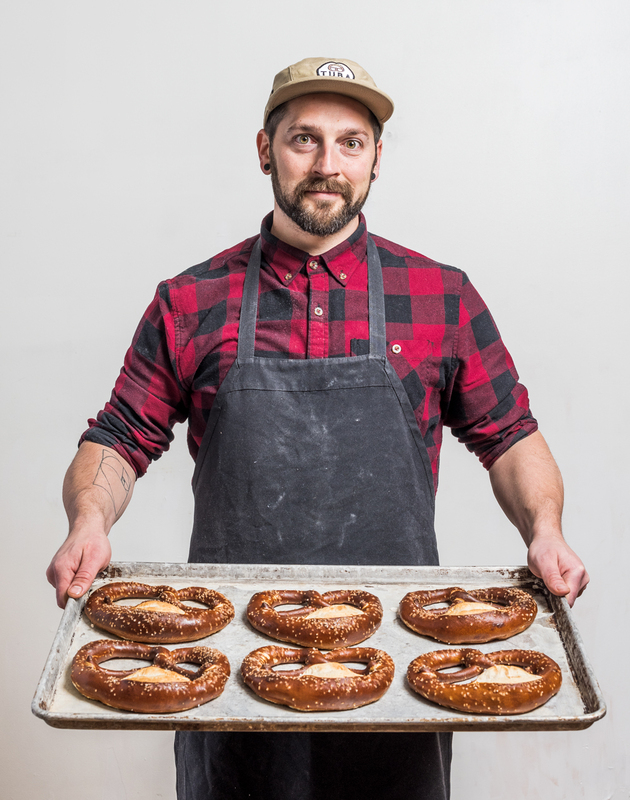 Tuba Baking Co. is a wholesale Swabian pretzel business, which currently sells to Queen City Brewery, Urban Stead Cheese, and Bauer Farm Kitchen, to name a few. It all started with an online DNA test. Through ancestry.com, Drew Rath, a 33-year-old Ft. Thomas stay-at-home dad of three, discovered 16 generations of his father’s lineage hailed from Aldingen, a small town in Germany’s historic southwestern region of Swabia. Their livelihood: spelt and rye millers. 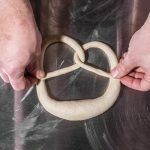 Inspired, and equipped with restaurant experience as a former chef at University Club of Cincinnati, Rath launched his wholesale Swabian pretzel business, Tuba Baking Co., last April, which currently sells to Queen City Brewery, Urban Stead Cheese, and Bauer Farm Kitchen, to name a few. What are Swabian pretzels? 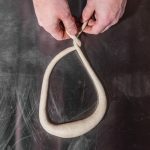 With higher fat and hydration levels than the Bavarian variety, the Swabian style’s skinnier, intertwined arms (connected near the top, not the bottom) give a harmonious crunch to their fat, soft bellies, which Rath splits before baking to release steam. 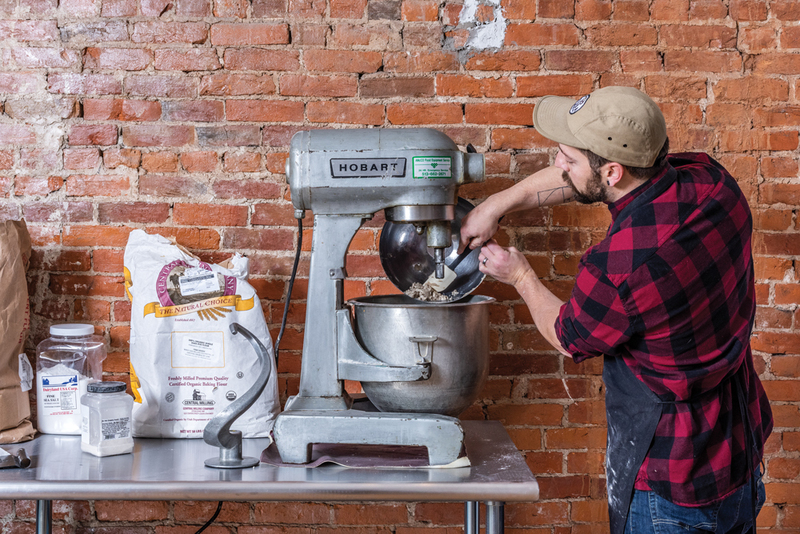 The dough’s all-rye flour also pulls out sugar during fermentation, adding a hint of sweetness. In January, after nine months operating in Newport’s Incubator Kitchen Collective, Rath opened his first independent space in the former Chako Bakery Café in Covington, where he hopes to eventually expand into retail sales. As for the baking itself, Rath hopes “it’ll become a family thing.” Fortunately, his children, ages 5, 3, and 1, have ample time to master their Swabian ancestors’ craft. To pay homage to his ancestors, Rath mixes all-rye flour with water and some of his 9-year-old rye sourdough starter (above). The mixture ferments for 12 to 24 hours, creating CO², so the dough becomes bubbly and sponge-like. Rath adds additional ingredients before dividing and weighing the dough into equal chunks. 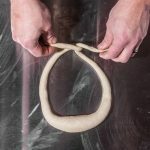 Rath hand-rolls the dough chunks so each pretzel’s “arms” are thinner than its “belly.” He twists the arms, connecting the ends near the pretzel’s top. 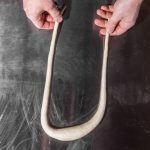 The shaped products ferment 12 more hours in the fridge and one hour in the freezer before Rath dips them in a lye mixture (food-grade sodium hydroxide plus water) and splits their bellies with a knife.